We’ve been supplying restroom mirrors for customers with all the public bathroom parts and accessories they need for almost 50 years. 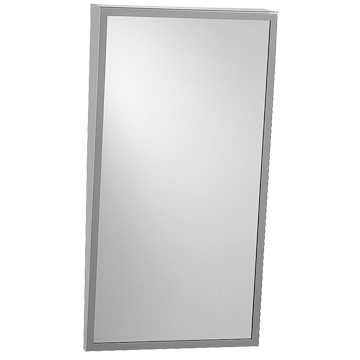 We carry a wide selection of bathroom mirrors designed to fit any size bathroom your building might have. Our experienced sales staff is standing by to assist with your order and answer all your questions. Our plated and stainless steel glass mirrors are perfect for commercial restrooms. We also offer laminated, tempered and plastic acrylic. Restroom accessories are vital whether they are for new installs or replacement hardware. With constant and continuous upgrade and improvements to designs in restrooms, one accessory that has less major changes to them is restroom mirrors. We have two manufacturer’s AJ Washroom and American Specialties who supplies the mirrors we list. Both carry the same or comparable mirrors and are highly reputable manufacturers. Restroom mirrors are used in many applications from public and commercial restrooms, individual restrooms, detention and community centers. With so many varieties for mirrors, let’s take a moment to get a quick rundown of the more common styles that both AJ Washrooms and American Specialties handles. One of the most common mirrors designs is the Channel Frame Mirror. The mirror is made of plated glass while frame is constructed of rolled 18 gauge stainless steel channels. Stainless steel rivets are used along with welded edges that are buffed and polished smooth to give a desirable appeal and durable design. This would be considered the more traditional/ standardized for restrooms and had different options for the glass and sizes. The Adjustable Tilt Mirror is the same mirror as the Channel Framed except it has the ability to be adjusted to different angles. It can be adjusted by the hinges that are located towards the top of the mirror on the side channels by pushing in or pulling out the mirror. With the capable of tilting up to a full 6” from the flat mount position to give flexibility in the restroom. This not as common but still a very versatile mirror considering this can be adjusted to help it user. Other glass options are available for this mirror as well as a variety of sizes. Another variation to restroom mirrors is the Fixed Tilt Mirror. For ADA accessibility, this mirror is designed to offers individuals in wheelchairs to visibility when using the restroom. Its frame is built of 20 gauge stainless steel and polished to give a clean and finished look. The mirror is tapered vertically from 1” at the bottom to 4” at top. This mirror has different options for the glass with the most common is the plate glass and also available in a variety of sizes. For those looking for something that appeals more towards safety and security, the Frameless Stainless Steel Mirror would be the ideal solution. This style of restroom mirror is often seen more in shower rooms, detention centers and locations where security and durability are most important. The mirror is constructed of stainless steel polished to a #8 mirror finish with 5/16” return. Mirror is ¼” thick and has a tempered waterproof mirror backing and comes in many sizes. American Specialties only offers this restroom mirror in stainless steel but AJ Washrooms does offer this in stainless steel and different glass/material types. Other Styles Available- Mirrors With Shelf, Security, and Angled Frame (Similar to Channel). Please contact us for more information about these products. There is a number of “Glass Type’s” available from the manufacturers. Glass Type refers to the material that is used to create the reflective mirrored section also known as mirror glazing options. Other Glass Types Available for some styles of mirrors (Laminate, Plastic Acrylic, etc). Please contact us for more information about these products. When installing restroom mirrors, there are a few guidelines individuals should follow. For Children, Bottom edge of mirror should be no more than 34” above finished floor. ADA Regulations require that if a mirror(s) is to be mounded above countertop or lavatories that the bottom edge of mirror be no more than 40” above finished floor. If a mirror is not being installed above a countertop or lavatory, bottom edge or mirror to be no more than 35” above finished floor. We’ve been supplying restroom mirrors for customers with all the public bathroom parts and accessories they need since 1970. 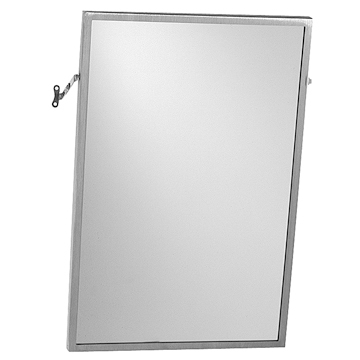 We carry a wide selection of bathroom mirrors designed to fit any size bathroom your building might have. Our experienced sales staff is standing by to assist with your order and answer all your questions. Our plated and stainless steel mirrors typical ship in about 3-5 business days. Adjustable Tilt Mirror 16" X 30" Offers visibility for wheel chair users or returns to upright position. 18 gauge stainless steel frame. Tilts full 6 degrees. 15 Year warranty against silver spoilage. Frames are roll formed to make the 1/2” x 1/2” x 1/2” channel, the corners are then mitered and secured with stainless steel rivets, with a #4 satin finish. Stainless steel hinge pivot brackets and piano hinge attached mirror to wall. Adjustable Tilt Mirror 18" X 24" Offers visibility for wheel chair users or returns to upright position. 18 gauge stainless steel frame. Tilts full 6 degrees. 15 Year warranty against silver spoilage. Frames are roll formed to make the 1/2” x 1/2” x 1/2” channel, the corners are then mitered and secured with stainless steel rivets, with a #4 satin finish. Stainless steel hinge pivot brackets and piano hinge attached mirror to wall. Adjustable Tilt Mirror 18" X 36" Offers visibility for wheel chair users or returns to upright position. 18 gauge stainless steel frame. Tilts full 6 degrees. 15 Year warranty against silver spoilage. Frames are roll formed to make the 1/2” x 1/2” x 1/2” channel, the corners are then mitered and secured with stainless steel rivets, with a #4 satin finish. Stainless steel hinge pivot brackets and piano hinge attached mirror to wall. Adjustable Tilt Mirror 24" X 30" Offers visibility for wheel chair users or returns to upright position. 18 gauge stainless steel frame. Tilts full 6 degrees. 15 Year warranty against silver spoilage. Frames are roll formed to make the 1/2” x 1/2” x 1/2” channel, the corners are then mitered and secured with stainless steel rivets, with a #4 satin finish. Stainless steel hinge pivot brackets and piano hinge attached mirror to wall. 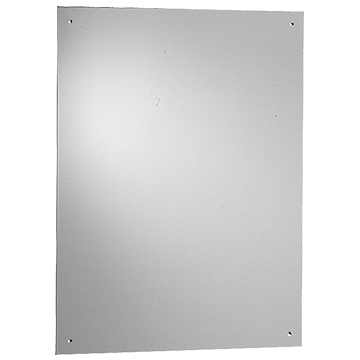 The Stainless Steel Channel Frame Mirror 16”X 20” is constructed of plate glass and type 304 stainless steel. Frames are roll formed to make the 1/2” x 1/2” x 1/2” channel, the corners are then mitered and secured with stainless steel rivets, with a #4 satin finish. 15 Year warranty against silver spoilage. Includes bracket for easy secure installation. The Stainless Steel Channel Frame Mirror 18”X 24” is constructed of plate glass and type 304 stainless steel. Frames are roll formed to make the 1/2” x 1/2” x 1/2” channel, the corners are then mitered and secured with stainless steel rivets, with a #4 satin finish. 15 Year warranty against silver spoilage. Includes bracket for easy secure installation. The Stainless Steel Channel Frame Mirror 18”X 36” is constructed of plate glass and type 304 stainless steel. Frames are roll formed to make the 1/2” x 1/2” x 1/2” channel, the corners are then mitered and secured with stainless steel rivets, with a #4 satin finish. 15 Year warranty against silver spoilage. Includes bracket for easy secure installation. 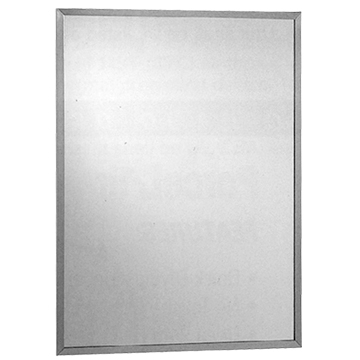 The Stainless Steel Channel Frame Mirror 20”X 26” is constructed of plate glass and type 304 stainless steel. Frames are roll formed to make the 1/2” x 1/2” x 1/2” channel, the corners are then mitered and secured with stainless steel rivets, with a #4 satin finish. 15 Year warranty against silver spoilage. Includes bracket for easy secure installation. The Stainless Steel Channel Frame Mirror 24”X 60” is constructed of plate glass and type 304 stainless steel. Frames are roll formed to make the 1/2” x 1/2” x 1/2” channel, the corners are then mitered and secured with stainless steel rivets, with a #4 satin finish. 15 Year warranty against silver spoilage. Includes bracket for easy secure installation. The Stainless Steel Channel Frame Mirror 36”X 48” is constructed of plate glass and type 304 stainless steel. Frames are roll formed to make the 1/2” x 1/2” x 1/2” channel, the corners are then mitered and secured with stainless steel rivets, with a #4 satin finish. 15 Year warranty against silver spoilage. Includes bracket for easy secure installation. The Stainless Steel Channel Frame Mirror 48”X 24” is constructed of plate glass and type 304 stainless steel. Frames are roll formed to make the 1/2” x 1/2” x 1/2” channel, the corners are then mitered and secured with stainless steel rivets, with a #4 satin finish. 15 Year warranty against silver spoilage. Includes bracket for easy secure installation.